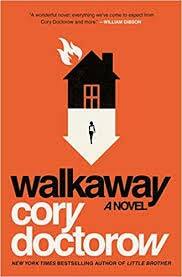 In Walkaway, Cory Doctorow takes on one of the most vexing matters of our time: Automation (more broadly, technological advances) is, at an accelerating rate, making human labor ever less necessary. But what will it lead to? A post-scarcity, egalitarian, “to each according to their wants” economy of abundance in which working is a matter of choice? Or to a version of the present artificial-scarcity economy in which there are an army of the poor and oppressed, and a few super-rich individuals who will resort to anything to retain their positions of power and privilege? In Walkaway, the answer is both. In Doctorow’s medium-near future, there’s both a drastically more repressive version of current society — to alter the famous quotation from Lincoln Steffens, “I have seen the future, and it’s worse” — and a (small “l”) libertarian and egalitarian alternative built by those who “walk away” from the dominant “default” society, a “post-scarcity” alternative made possible by sweeping technological/productivity advances. Therein lies the main virtue of Walkaway: Doctorow’s convincing, detailed, and attractive portrayal of that post-scarcity society and its workings. To get a bit politically wonkish, what Doctorow describes, though he never uses the term, is an anarcho-communist society (in contrast to the other flavors of anarchism: individualist, mutualist, and syndicalist). Other virtues include Doctorow’s insightful treatment of technological advances, notably in the liberatory and repressive possibilities they entail, and in the book’s humor, which mostly appears in its first 150 pages. As for the plot, it would give away too much to say more than that it revolves around the brutal repression of the walkaways, and their use of nonviolent resistance in response, after they develop a technology that the ultra-rich of “default” society find threatening. Anther problem with the book is that it seems disjointed at times. This is in part due to Doctorow’s using five p.o.v. characters. This isn’t necessarily a problem (see George Turner’s effective use of multiple [five] p.o.v.s in Drowning Towers), but it is here. Doctorow switches from one to another purely to advance the story, with the amount of time devoted to the different p.o.v.s varying considerably; and, as Walkaway progresses, it all but abandons the p.o.v. of what I originally thought was the primary p.o.v. character. It doesn’t help that there’s little if any overlap — no differing views of the same things, a la Rashomon — in the events described from the different p.o.v.s, which aggravates the disjointedness problem. Still, Walkaway‘s virtues — especially it’s detailed, attractive portrayal of a libertarian post-scarcity society — outweigh its faults. Walkaway is quite probably the best fictional description of a post-scarcity society ever written. Zeke Teflon is the author of Free Radicals: A Novel of Utopia and Dystopia (pdf sample here). He’s currently working on the sequel, and on an unrelated sci-fi novel, in his copious free time. “It would be hard to overstate the time and talent wasted in the study of this so-called science. The men who believed in astrology thought that they lived in a supernatural world–a world in which causes and effects had no necessary connection with each other–in which all events were the result of magic and necromancy.